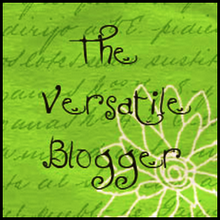 Deelicious Sweets: Versatile Blogger Award! I would like to give great big super thanks and big hugs to I heard it's Yummy and Chef in Disguise for passing on to me The Versatile Blogger Award! I Heard it's Yummy is pretty new to the foodie blog world and she's already winning awards left and right! She is super sweet and makes an outstanding Sassy Potato Corn Chowder. Hurry on over and check it out! It's perfect for the chili weather that is arriving. Chef in Disguise is one of my oldest and sweetest foodie friends! I'm sure many of you already know her and follow her. If not, you're missing out! Her recipe index is as long as my arm and I have really long arms! Hurry on over and just try to pick one recipe of hers to bookmark! This award comes with rules. I have to list 7 things about myself that you may not know. If you're a regular reader you probably know more than you want to know about me but here goes! 1. I am an introvert. I know, right! Who knew. In social situations I'm more than likely the one being talked to because I'm a better listener than a talker. It must be written across my face because I always get stuck with the talkers at the party telling me all about their life and their issues. I should have been a psychologist. 2. Social situations make me nervous. My chest breaks out in red splotches when I get nervous which is anytime I'm in a social situation. I may need to go see a psychologist. 3. In order to break my social situation nervousness I try to put myself in situation's that would make me nervous. For instance, teaching yoga! 4. I have no idea what else to write about myself. 5, If you want to know 7 other things about me, you can read about more here. 6. If you really want to know 7 more things about me, you can read about more here. 7, I love shoes and purses. Second rule. Choose some fabulous bloggers to pass this award on to. This is the easy part! 2. Stephanie over at Eat. Drink. Love. I would have loved to put every single blogger that is in my google reader on this list but that would have been a list that reached well into the hundreds. Everyone of you is fabulous and I appreciate each and every one of you! Oh my goodness, you are so sweet! Thank you so much for your kindness, you so deserve this award! I am thankful we met on Facebook and that you introduced me to Foodbuzz. Can't wait to keep reading your yummy recipes!! Hugs! Thanks Dee!! You're pretty amazing yourself you know! Thanks so much for the award, Dee! What a pleasant surprise. I'll have to check out all those other blogs; they sound delicious! Oh, Dee! Thank you so much for passing your award onto me! I can't wait to check out all these great bloggers and to learn some new facts about you! Congrats!! Well deserved award for sure! Dee, Congratulations!!! You certainly are one of my favorites! I always enjoy visiting your site. I am shocked that you are an introvert! I'm the complete opposite as I am the extrovert, but one - like you - that listens. I can't tell you how many strangers have told me about their health problems! :) Love your list! THANK YOU for passing this award to me. I'm truly flattered! Thanks, Dee! I appear to be an introvert in new situations, but once you know me, all bets are off. ;) I am with you on the shoes and purses too. Thank you, thank you, thank you for this award, you are awesome!! And I love the new header! So sorry I missed this Dee!